Less than six months after the retirement of our City Manager Barry Nagel, the city council is posed to appoint a new manager at the council meeting Wednesday March 12. Currently Steve Mattas is our interim manager and will return to his original position as our contracted legal counsel with the law firm Meyers Naves . It is worthy to note we have also lost many leaders to retirement in the past few months: Marty Van Duyn, Susan Kennedy and Donna Ochoa from the City Manager’s office, Gerry Beaudin our Principal Planner, and Director of Public Works Terry White and our Fire Chief Phil White. In September the council had considered hiring Jesus Armas yet withdrew the offer. Armas had been our city manager back in the 80’s and in more recent years he had been the city manager of Hayward. He was known for moving the city through some major developments which shows the direction our city council and staff plan for the future of South San Francisco. A very bold and progressive step is being made by appointing Mike Futrell who comes to us with a very full resume including ‘an attorney, United States Navy officer, public official, and Republican politician from Baton Rouge, Louisiana.’ Futrell is credited with handling some impressive changes in Baton Rogue Louisiana which is his home town. South San Francisco will be an interesting change to this man who has seen many changes during his career(s) and we welcome him to our community. With so many developments coming into our city, this is definitely a defining moment of change. The huge economic benefits San Francisco is experiencing during it’s tech renaissance is something our city leaders hope to see more of in our own town. Since we are geographically located between the city and San Jose, this area is ripe for major expansion. There will be a need for a delicate balancing act between preserving the best of our city as we forge ahead. Below is the Futrell’s bio from Wikipedia as well as the city press release. 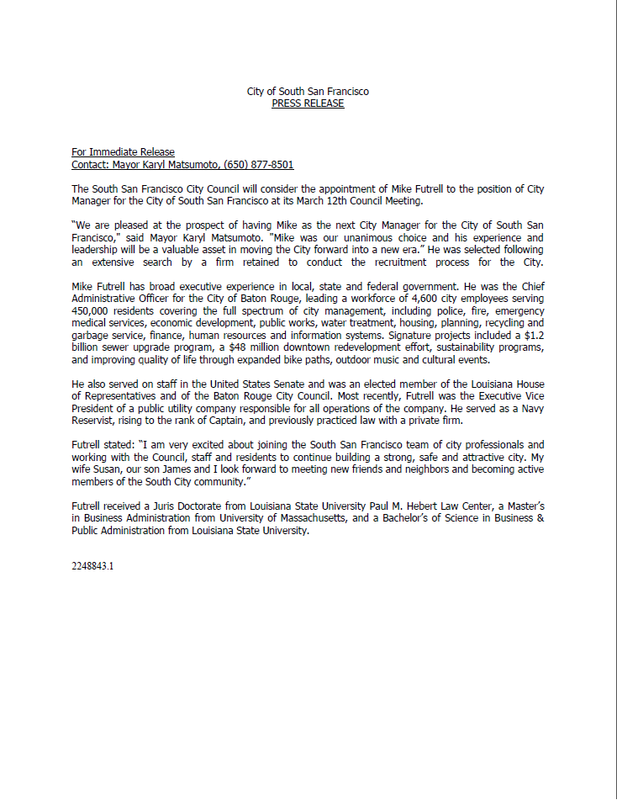 To see the appointment join in on the City Council Meeting tomorrow evening, starting at at 7pm at the MSB 33 Arroyo. Council meetings can also be viewed live stream via the city website (CLICK HERE) and on community TV channels ASTOUND 26 and COMCAST 27. Michael “Mike” Futrell (born 1960) is an attorney, United States Navy officer, public official, and Republican politician from Baton Rouge, Louisiana. From 2000 to 2005, Futrell served in the Louisiana House of Representatives from District 66 in East Baton Rouge Parish. He resigned a year into his second term to become the state director for freshman U.S. Senator David Vitter. Having followed Democrat-turned-Republican Woody Jenkins in the House, Futrell was himself succeeded by another Republican lawyer, Hunter Greene. Journalist John Maginnis said that Futrell did not stand out during his tenure in the legislature but was well-liked and well-regarded. Futrell’s resume indicates that in 2002, he received the “Golden Apple Legislators Support of Education” award. In 2004, he obtained the Louisiana Municipal Association Leadership Award. In 2005, he procured the Louisiana Family Forum Legislative Advocate Award. Prior to the House tenure, Futrell was from 1997 to 2000 the District 8 member of the East Baton Rouge Parish Metro Council. He was elected without opposition in September 1996 to succeed the incumbent Republican member Lynda Imes, who instead ran for the Louisiana State Senate but lost to the Republican Jay Dardenne. In 2008, after leaving Vitter’s staff, Futrell became the assistant chief administrative officer of the City of Baton Rouge, serving under Walter Monsour. In 2009, upon Monsour’s retirement, Futrell was elevated to chief accounting officer by Baton Rouge Mayor-President Kip Holden, a Democrat. A native of Baton Rouge, Futrell was reared in the Sherwood Forest subdivision. In 1978, he graduated from Baton Rouge High School. In 1982, he received his Bachelor of Business Administration from Louisiana State University in Baton Rouge. In 1985, he received the Juris Doctor degree from the LSU Paul M. Hebert Law Center. He is a U.S. Navy veteran and also a graduate of the Air Force Command and Staff College at Maxwell Air Force Base in Montgomery, Alabama. From 1987 to 1993, Commander Futrell served two tours of duty as an officer on nuclear submarines. On the USS Grant, near the end of the Cold War, Futrell came in constant contact with submarines of the former Soviet Union. The communists tracked the American vessels so that they could attack immediately if war were suddenly declared. The Americans tried to avoid attack to remain a nuclear deterrent against the Soviets. Futrell also served on the submarine, the USS Kentucky. Futrell said that he had considered becoming an attorney for the Judge Advocate General‘s office but instead entered a private firm in Baton Rouge. In 2006, while on Vitter’s staff, Futrell was recalled to active duty for six months during the Iraq War. For that service, he won the Bronze Star. Futrell was assigned to find still usable war materials and classified information whenever a military vehicle was damaged in combat. He soon returned to Vitter’s office to manage the D. C. Madam scandal. He resigned as Vitter’s state director, not because of that controversy, but because he desired to return permanently in Baton Rouge, and the state directorship had required travel throughout the state to Vitter’s seven district offices. 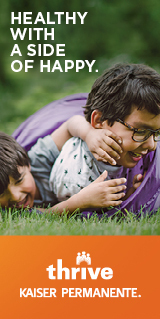 ← What makes South City ‘Home’ to you? This Wikipedia article has a number of inaccuracies and is incomplete. My only question is: If he left other powerful positions to return home to Baton Rouge, why does he now want to be here?